Remy Simon presenting to the Gallipolis Garden Club. 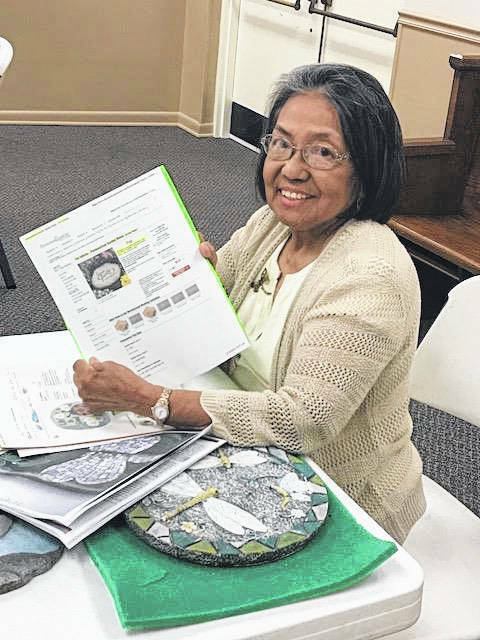 GALLIPOLIS — Remy Simon recently demonstrated a way for members of the Gallipolis Garden Club to accessorize their gardens as well as to provide a way to lead guests to their gardens with stepping stones. Not only are the stones a way to keep the feet clean, they are also a way to point to all the hard work that a garden worker has done in the garden. Stepping stones may be concrete or they may be made of glass chips. Some are now painted to glow in the dark. Some club members expressed a great deal of interest in making some of their own gardens. The next meeting will be held on August 9 beginning at 7 p.m. in the fellowship hall the Presbyterian Church. Anyone interested in gardening is welcome to attend.